The PalletSaw type W is a pallet stripping machine and is ideal for removing defective parts of pallets or completely dismantling of pallets. The best features of all the previous models is brought into one machine. The machine is available with various options. The speed is variable adjustable wich makes the machine very appropriate when using it to repair pallets. The scissor mechanism always gives you the right amount of stability and makes sure that the table is always parallel to the bandsaw. The footpedal works very good thanks to the use of a spring tensioner. Only 2 safetyswitches what minimalizes a chance of mailfunction. Made of solid steel and is very easy to adjust. The motor is equipped with a motorized brake, wich can stop the bandsaw immediatly when neccesary. 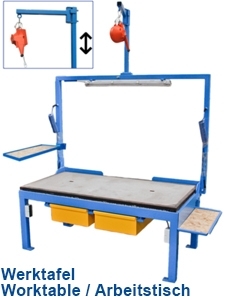 The stripping machine is suitable for dismantling and repairing of pallets. The stripping machine can be operated by 1 person. The hands are completely free by the use of a footpedal. The cutting of nailresidu is no longer required. CE Certificate (very important) is attached.